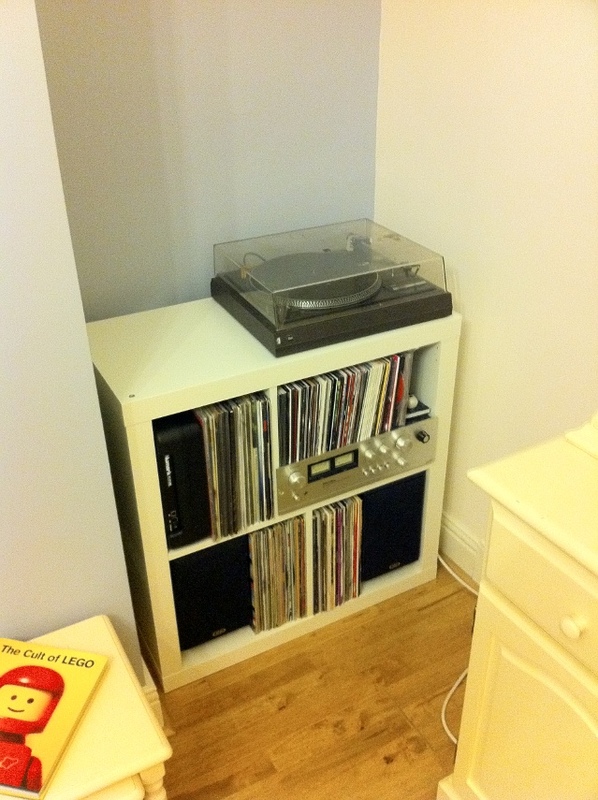 A mildly hacked Ikea "Expedit" shelving unit is a surprisingly snug home for my Hi-fi and my vinyl collection (even the 7" records). yo man this is awesome, how did you 'hack' it?! I've the same unit and it's almost perfect but scared of messing with it.. but had same vision in mind! It's been a few years so I can't remember the specifics. What I can remember is, when you assemble the unit (it would be a Kallax now) you start with the bottom, the sides are all-in-one, the middle shelf is all-in-one and the two vertical bits are separate from each other, so you put the bottom vertical bit in as normal, then the horizontal shelf. When you come to the upper vertical bit, I measured the width of my amplifier and drilled two holes in the shelf at that offset, and fit the vertical bit in there. I had to then measure out corresponding vertical holes in the top bit for when I fit that on. These bits are all joined together with little wooden dowelling rods. One thing I would do differently if I did this again: my current amp is slightly narrower than average, it's around 41cm wide. The facia is wider, but that sits proud of the unit. However, I'm looking to replace the amp and all the newer ones seem to be 42-43cm, so I'm probably going to have to try and move that vertical bit further out, which might be much harder now It's all assembled. Other hacks I plan to do: fit small lengths of wood horizontally across the rear in two places to act as retainers for the records, to stop you pushing them out the back, and fit cupboard doors on the front to stop cats or children from damaging the records. 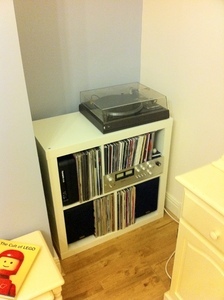 I've had to place spare record frames over the fronts as a temporary measure. I found my cat stretched out trying to scratch them once!